Home / Blog / E.R.E.S. News / Stainless Steel or Aluminum? Stainless steel or aluminum? 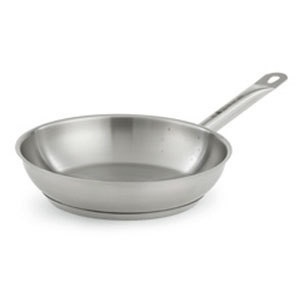 There are a few other materials commonly used to manufacture frying pans, such as carbon steel, cast iron, copper and even enamel, but the vast majority of what you see being used in professional commercial kitchens is manufactured with aluminum, stainless steel or both. Here is some information to help you shop. Aluminum: Conducts heat well, is durable, lightweight and affordable. Unfortunately, it is reactive with acidic foods, like wine or tomatoes, and can alter the color (and maybe even the taste) of lightfoods and sauces. It can also warp. Stainless Steel: Is very durable and resistant to scratches, dents and corrosion. It is also non reactive with food. However, stainless steel doesn’t conduct heat as well or as evenly as aluminum. It takes longer to heat up, and the heating is often uneven. Stainless steel pans are notorious for hotspots that can scorch food. Manufacturers have developed a number of improved frying pans to overcome the limitations of all aluminum and all stainless steel pans. Stainless Steel/Aluminum: Manufacturers fuse a layer of stainless steel and a layer of aluminum together. 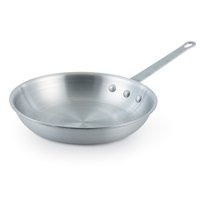 The result is a frying pan with an aluminum body that conducts heat faster and more evenly to eliminate hot spots and scorching, coupled with a stainless steel cooking surface that is durable, corrosion resistant and non-reactive with foods. Aluminum Clad Stainless Steel: Taking it a step further, “clad” frying pans feature a layer of aluminum (or an aluminum disk) sandwiched in between two layers of stainless steel. The completely stainless steel exterior makes the pan durable, corrosion resistant, and non-reactive with foods. The aluminum layer in between helps conduct heat faster and more evenly to eliminate hot spots and scorching. Anodized Aluminum or “Hard Coat”: The pan is specially treated to make the surface non-porous and more resistant to corrosion. The anodized layer is non-reactive with food, several hundred times harder than untreated aluminum and stick-resistant. Anodized pans take a bit longer to heat up than regular aluminum and are generally not dishwasher safe. The outer anodized layer is very thin and will wear over time. If your kitchen uses an induction range, you’ll want induction ready pans. Most say that stainless steel pans are induction ready, but look for pans that are specifically labeled as induction ready. Choose stainless steel handles. Stainless steel handles are strong and will remain cooler than aluminum handles. Riveted handles are the sturdiest.